The Hudson River, called Muh-he-kun-ne-tuk in Mahican, is a river that runs through the eastern portion of New York State and, along its southern terminus, demarcates the border between the states of New York and New Jersey. It is named for Henry Hudson, an Englishman sailing for the Netherlands, who explored it in 1609. Early European settlement of the area clustered around the river. 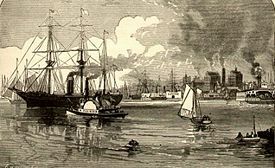 The Hudson later became a major source of transportation and economic development in the U.S. when the Erie Canal provided a link, by way of the Hudson, between New York Harbor and the Great Lakes. The area inspired the Hudson River School of painting, a sort of early American pastoral idyll. The river is the natural western boundary of the area of the United States known as New England. By virtue of the Erie Canal it became a means for vital shipping lanes connecting the midwest United States to New York Harbor, as well as the site of great natural beauty, picturesque towns and villages, majestic bridges, hydro-electric power, and recreational opportunities. The English navigator Henry Hudson was one of the most important explorers of the New World. In 1609, the Dutch East India Company heard about Hudson's skill as a navigator from an expedition he had taken in 1607 on a small ship called the Hopewell, in which he aimed at finding an easterly northern passage to the Orient via the North Pole and Russia. The company hired him for the same mission, and in April of 1609, Hudson set sail with a group of English and Dutch seamen to Amsterdam on a ship named the Half Moon. Hudson set sail north, only to encounter cold weather and ice, which discouraged crew members. Despite orders to return to Holland if no route was found, he decided to sail towards warmer waters. Steering west and then south along the North American coast, Hudson entered the Chesapeake and Delaware Bays before turning north to what we know today as New York State. He proceeded past New York Harbor and sailed up north the waters that today bear his name, thus reaching present-day Albany. There, he named the river "Great River of the Mountains" and claimed the surrounding countryside for Holland. The official source of the Hudson is Lake Tear of the Clouds in the Adirondack Mountains. However, the waterways from the lake are known as Feldspar Brook and the Opalescent River, which feed into the Hudson at Tahawus. The actual Hudson River begins several miles north of Tahawus at Henderson Lake. The Hudson is joined at Troy (north of Albany) by the Mohawk River, its major tributary. Just south of there is the Hudson River Valley divided by the federal dam which separates the Upper Hudson River Valley from the Lower Hudson River Valley. South of Troy, the Hudson widens and flows south into the Atlantic Ocean between Manhattan and the New Jersey Palisades, forming New York Harbor at New York Bay, an arm of the Atlantic. The Hudson was named the "North River" by the Dutch, who also named the Delaware River the "South River." This name persists to this day in radio communication among commercial shipping traffic, as well as place names such as the North River Sewage Treatment Plant. It was the English who originated the Hudson name, even though Hudson had found the river while exploring for the Dutch. The Mahican name of the river, Muh-he-kun-ne-tuk, means "the river that flows both ways." 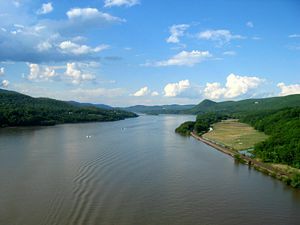 The Hudson is often mistaken for one of the largest rivers in the United States, but it is actually an estuary throughout most of its length below Troy. The mean freshwater discharge at the river's mouth in New York is approximately 21,400 cubic feet (606 m³) per second. Strong tides make parts of New York Harbor difficult and dangerous to navigate. During the winter, ice floes drift south or north, depending upon the tides. 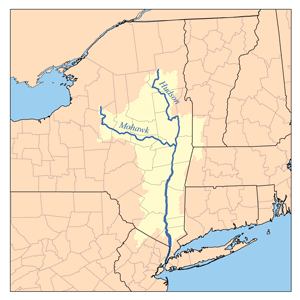 The Hudson and its tributaries—notably the Mohawk River—drain a large area. Parts of the Hudson River form coves, such as Weehawken Cove in Hoboken, New Jersey and Weehawken. The Hudson is sometimes called a "drowned" river. The rising sea levels after the retreat of the Wisconsin Glaciation, the most recent ice age, resulted in a marine incursion that flooded the coastal plain and brought salt water well above the mouth of the river. Now part of the ocean, the deeply-eroded old riverbed beyond the current shoreline, Hudson Canyon, is a rich fishing area. The former riverbed is clearly delineated beneath the waters of the Atlantic, extending to the edge of the continental shelf. Notable landmarks on the Hudson include the United States Military Academy at West Point, the Culinary Institute of America, Marist College, Bard College, The Unification Theological Seminary, the Thayer Hotel at West Point, Bannerman's Castle, Metro-North Railroad's Hudson Line (formerly part of the New York Central Railroad system), the Tappan Zee Bridge, the New Jersey Palisades, Hudson River Islands State Park, Hudson Highlands State Park, New York Military Academy, Fort Tryon Park with The Cloisters, Liberty State Park, and Stevens Institute of Technology. Cities and towns on the New Jersey side include Tenafly, Fort Lee, Weehawken, Hoboken, and Jersey City. Cities and towns on the New York side include Troy, Albany, Kingston, Poughkeepsie, Glens Falls, Beacon, Haverstraw, Yonkers, and New York City (Manhattan, The Bronx). The natural beauty of the Hudson Valley earned the Hudson River the nickname "America's Rhine", being compared to that of the famous 40 mile (65 km) stretch of Germany's Rhine River valley between the cities of Bingen and Koblenz. It was designated as one of the American Heritage Rivers in 1997. Close up of The Narrows, as seen by satellite. 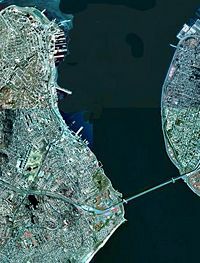 Staten Island is on the left, and Brooklyn is on the right, connected by the Verrazano-Narrows Bridge (Public Domain photograph from NYSGIS). The Narrows, a tidal strait between the New York City boroughs of Staten Island and Brooklyn, connects the upper and lower sections of New York Bay. It has long been considered the maritime "gateway" to New York City and historically has been the most important entrance into the harbor. The Narrows were most likely formed about 6,000 years ago at the end of the last ice age. Previously, Staten Island and Long Island were connected, preventing the Hudson River from terminating via The Narrows. At that time, the Hudson River emptied into the Atlantic Ocean through the present course of the lower Raritan River by taking a more westerly course through parts of present-day northern New Jersey, along the eastern side of the Watchung Mountains to Bound Brook and then on into the Atlantic Ocean via Raritan Bay. A build-up of water in the Upper Bay eventually allowed the Hudson River to break through previous land mass that was connecting Staten Island and Brooklyn to form The Narrows as it exists today. This allowed the Hudson River to find a shorter route to the Atlantic Ocean via its present course between New Jersey and New York City (Waldman, 2000). Haverstraw Bay, the widest part of the river, is located between Croton Point in the Southeast and the town of Haverstraw in the Northwest. Haverstraw Bay is a popular destination for recreational boaters and is home to many Yacht clubs and marinas, including Croton Yacht Club, Croton Sailing School, and Haverstraw Marina. The Hudson River is navigable for a great distance above mile 0 (at 40°42.1'N., 74°01.5'W.) 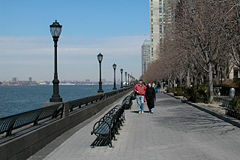 off of Battery Park (New York). 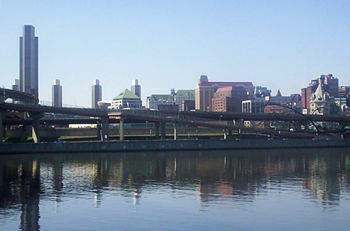 The original Erie Canal, which opened in 1825 to connect the Hudson with Lake Erie, emptied into the Hudson at the city of Albany's basin, just three miles south of the Federal Dam in Troy (at mile 134). The canal enabled shipping between cities on the Great Lakes and Europe via the Atlantic Ocean. The New York State Canal System, the successor to the Erie Canal, runs into the Hudson River north of Troy and uses the Federal Dam as the Lock 1 and natural waterways whenever possible. The first railroad in New York, the Mohawk and Hudson Railroad, opened in 1831 between Albany and Schenectady on the Mohawk River, enabling passengers to bypass the slowest part of the Erie Canal. Hudson from Midtown Manhattan with Javits Convention Center in foreground. The beginning of the New Jersey Palisades is visible across the river. 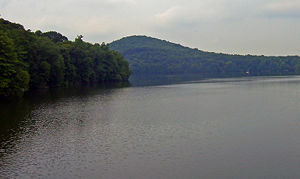 The Delaware and Hudson Canal ended at the Hudson at Kingston, running southwest to the coal fields of northeastern Pennsylvania. In northern Troy, the Champlain Canal split from the Erie Canal and continued north along the west side of the Hudson to Thomson, where it crossed to the east side. At Fort Edward, the canal left the Hudson, heading northeast to Lake Champlain. A barge canal now splits from the Hudson at that point, taking roughly the same route (also parallel to the Delaware and Hudson Railway's Saratoga and Whitehall Railroad) to Lake Champlain at Whitehall. From Lake Champlain, boats can continue north into Canada to the Saint Lawrence Seaway. The Hudson Valley also proved attractive for railroads once technology progressed to the point where it was feasible to construct the required bridges over tributaries. The Troy and Greenbush Railroad was chartered in 1845 and opened that same year, running a short distance on the east side between Troy and Greenbush (east of Albany). The Hudson River Railroad was chartered the next year as a continuation of the Troy and Greenbush south to New York City and was completed in 1851. In 1866, the Hudson River Bridge (Albany) opened over the river between Greenbush and Albany, enabling through traffic between the Hudson River Railroad and the New York Central Railroad west to Buffalo. The New York, West Shore, and Buffalo Railway ran up the west shore of the Hudson as a competitor to the merged New York Central and Hudson River Railroad. Construction was slow, and it was finally completed in 1884. The New York Central purchased the line the next year. The Upper Hudson River Valley was also useful for railroads. Sections of the Rensselaer and Saratoga Railroad, Troy and Boston Railroad, and Albany Northern Railroad ran next to the Hudson between Troy and Mechanicville. North of Mechanicville, the shore was bare until Glens Falls, where the short Glens Falls Railroad ran along the east shore. At Glens Falls, the Hudson turns west to Corinth before continuing north; at Corinth, the Adirondack Railway begins to run along the Hudson's west bank. 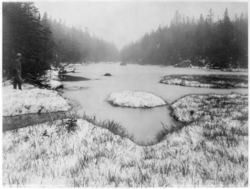 The original Adirondack Railway opened by 1871, ending at North Creek along the river. During World War II, an extension opened to Tahawus, the site of valuable iron and titanium mines. The extension continued along the Hudson River into Hamilton County and then continued north, where the Hudson makes a turn to the west, crossing the Hudson and running along the west shore of the Boreas River. South of Tahawus, the route returned to the east shore of the Hudson the rest of the way to its terminus. Looking upriver from from Olana, Frederick Church's home. Frederick Church was a leading influence of the Hudson River School. The mighty Hudson also inspired an important nineteenth century American art movement known as the Hudson River School. This movement consisted of a group of landscape painters, whose aesthetic vision was influenced by romanticism. 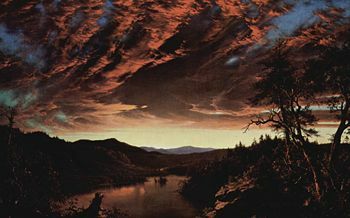 Well known artists of the Hudson River School include Thomas Cole, Frederic Edwin Church, John Frederick Kensett, and Sanford Robinson Gifford. Their paintings depict the Hudson River Valley and the surrounding area. The style of the Hudson River School reflects the themes of discovery, exploration, and settlement and is characterized by a realistic, detailed, and sometimes idealized portrayal of nature. The paintings also depict the American landscape as a pastoral setting, where human beings and nature coexist peacefully. Although the artists varied in the depth of their religious conviction, Hudson River School artists generally believed that nature, in the form of the American landscape, was an ineffable manifestation of God. On September 14, 1901, then-Vice President Theodore Roosevelt was at Lake Tear of the Clouds after returning from a hike to the Mount Marcy summit when he received a message informing him that President William McKinley, who had been shot two weeks earlier but was expected to survive, had taken a turn for the worse. Roosevelt hiked down ten miles (16 km) on the southwest side of the mountain to the closest stage station at Long Lake, New York. He then took a 40 mile (64 km) midnight stage coach ride through the twisting Adirondack Roads to the Adirondack Railway station at North Creek, where he discovered that McKinley had died. Roosevelt took the train to Buffalo, New York where he was officially sworn in as President. The 40 mile route taken by Roosevelt is now designated the Roosevelt-Marcy Trail. The Hudson River serves as a political boundary between the states of New Jersey and New York, and further north between New York counties. The northernmost place with this convention is in southwestern Essex County. 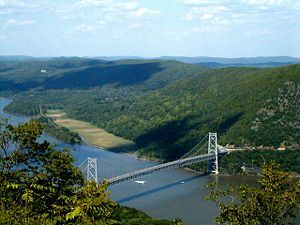 The Bear Mountain Bridge across the Hudson River between Rockland and Orange Counties to the west and Westchester and Putnam Counties to the east. General Electric Corporation has been involved in a long-lasting battle over the cleanup of polychlorinated biphenyl contamination of the Hudson. According to the United States Environmental Protection Agency (EPA): "The General Electric Company discharged between 209,000 and 1.3 million pounds of polychlorinated biphenyls (PCBs) into the river from two capacitor manufacturing plants located in Hudson Falls and Fort Edward." In 1983, the EPA declared a 200 mile (322 km) stretch of the river, from Hudson Falls to New York City, to be a "Superfund" site. GE will soon commence dredging operations at its own expense to clean up the PCBs. Inspired by Earth Day advocates, this action anchored the Riverkeeper program that grew into a global umbrella organization, the Waterkeeper Alliance. The Hudson River Sloop Clearwater is an environmental education organization that promotes awareness of the river and its history. The Hudson River estuary system is part of the The National Estuarine Research Reserve System. ↑ Self Guided Tour of Troy and Green Island. railroad.union.rpi.edu. Retrieved August 11, 2007. ↑ EPA Hudson River [PCBS. www.epa.gov. Retrieved August 11, 2007. ↑ NY State Environmental Conservation. www.dec.state.ny.us. Retrieved August 11, 2007. ↑ Network of 27 Protected Areas. neers.noaa.gov. Retrieved August 11, 2007. PCB Cleanup and related matters.. www.hudsonwatch.net. Hudson River Watertrail Association. www.hrwa.org. Historic Hudson River Towns. www.hudsonriver.com. The Hudson River Environmental Society. www.hres.org. This page was last modified on 17 January 2018, at 16:09.